It's true, ladies and gents. I tried a panini at Gardina's in Oshkosh and my life will never be the same. I've always been a fan of interesting dishes and unlikely combinations, and Gardina's has a menu full of them. It all started while I was walking home from my group project yesterday afternoon. The girl I was working with went off to get food with her meal plan, and I, meal plan-less, started walking in the direction of my apartment. My apartment with the sinfully barren fridge... I was hungry and had no idea what I was going to do with my life, when my friend Lilly texted me to ask if I wanted to go to Gardina's. Without hesitation, I said yes and kept walking in the direction of my apartment. She told me to text Kailey for a ride since she was tanning near where I live. Somehow, the stars aligned and as I walked past the tanning salon I saw Kailey walking out. It all happened so fast. I thought to myself, "I'm going to be able to eat today!" Before I knew it, I was on my way to my new favorite cafe in Oshkosh. 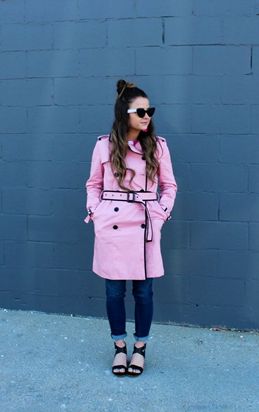 If you learned nothing from that dramatic little tale, know this: Gardina's is simply amazing. 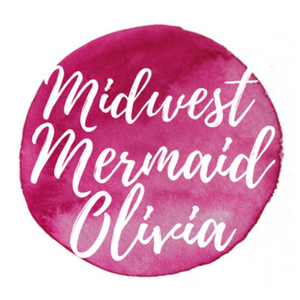 Last time I went, I ended up spending like $30 on wine, appetizers, and cheesecake and trust me, I am usually an "Um, is that guacamole extra?" kind of spender. Gardina's is worth it. If it hadn't been 3:00 in the afternoon, I would have went all out with the wine too. Mine was: Thin sliced pear, brie, drizzled with Wisconsin honey. With turkey. And the french onion soup...better than Panera's. And I never say things like that. And then I got the mini cheesecake, which is a little pricey for what it is, but it's just enough cheesecake for me. Last time we went a little nuts and ordered the whole cheesecake platter (but we also had just each drank 2 glasses of wine...) This time I just went with the turtle. They put these unexpected little spiced nuts on top which are phenomenal. I literally cannot get enough. And I'm also obsessed with the two appetizers I tried last time: the Classic Bruschetta (always a winner) and the BBT Pesto Flatbread (just try it). Yes, it's been over a week, but I'm a busy girl! I know most peoples' bathrooms probably aren't that much of a conversation starter, but I can safely say that mine is a lot more interesting. 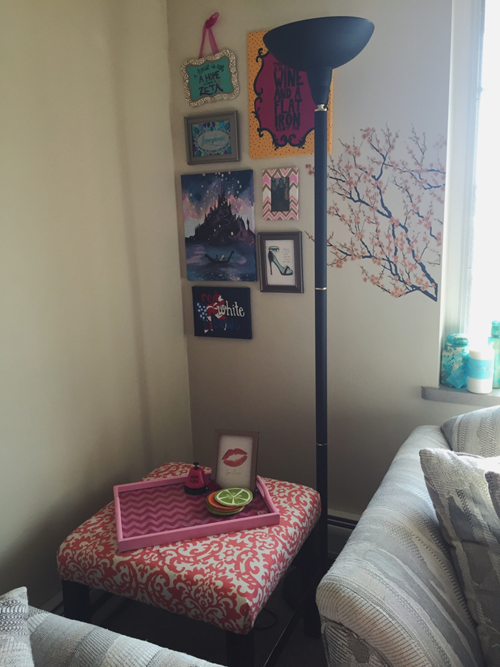 It's actually my favorite room (decor-wise) of my apartment. 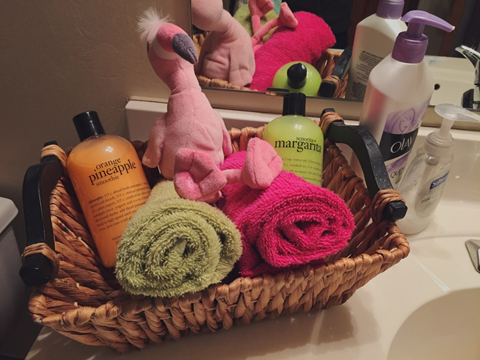 It's bright and cheery and where I keep all the pink. I make the comment about the pink because the place I lived previous to this apartment was literally a pink palace/dorm. Current roommate is not so much a fan of the magenta hues. I thought it would be best to concentrate my signature color in one room (as not to offend...haha). 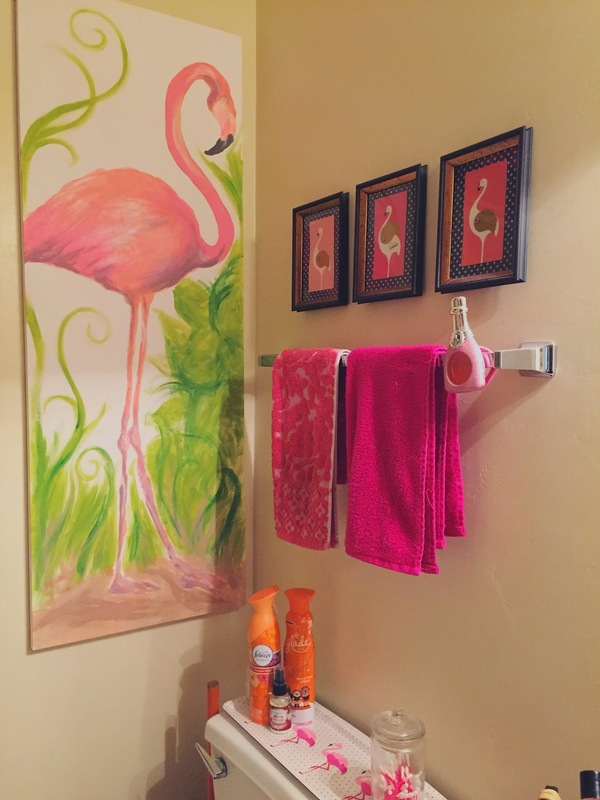 I figured saying the bathroom was going to be "flamingo" themed was a clever way of incorporating The Best Color Ever without being too obvious about it. But as you read the rest of this post, it's pretty obvious. 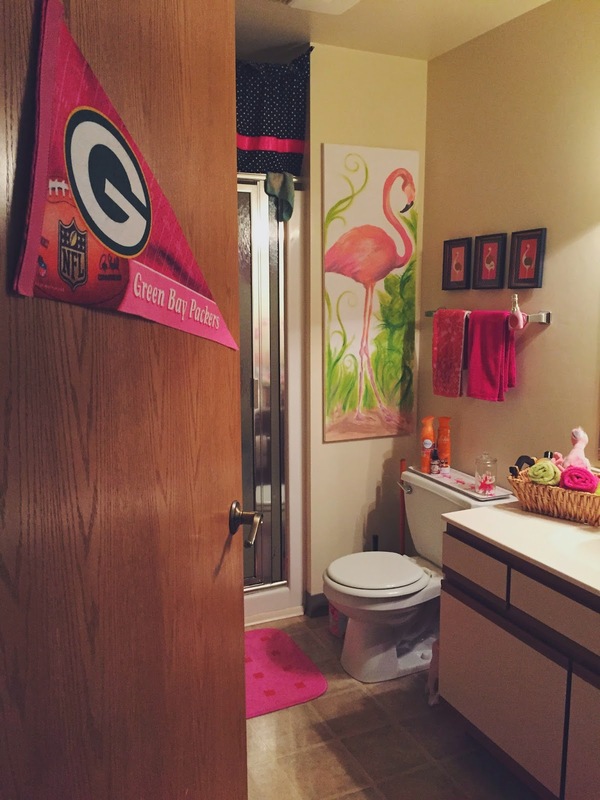 So basically the pink Packer pennant points you in the direction of flamingo heaven. 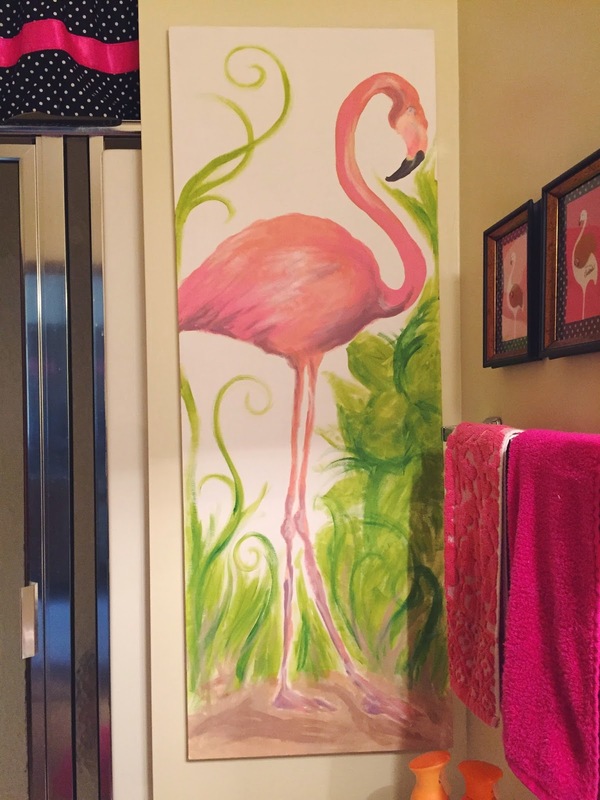 I painted that flamingo in the corner (and actually had to make the entire canvas -_- I'm too cheap to buy something that huge pre-made). 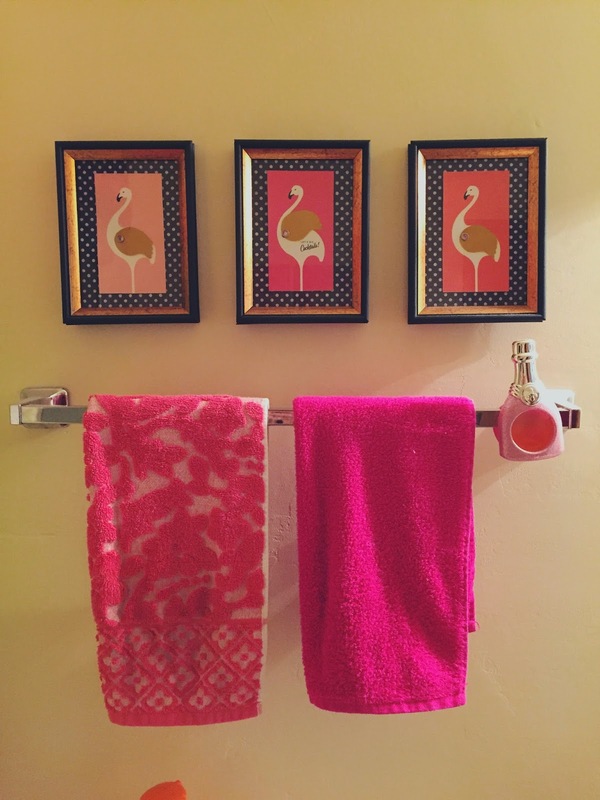 The 3 matching framed flamingos are another fave of mine! And like in my last post, they are free from Best Friends for Frosting (and Oh Happy Day). They say "Let's do cocktails" because they're actually party invites. I decided they work better as wall art. You have to attach your own wings to them, so I used gold like they suggested. I just mounted them on scrapbook paper and put them in dollar store frames. Have I mentioned how obsessed I am with them? 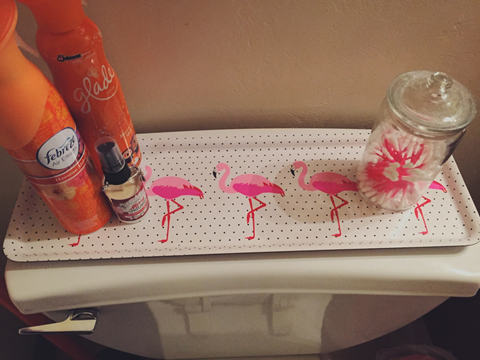 And yes, that's a Bath & Body Works air freshener... I don't have a car, okay? 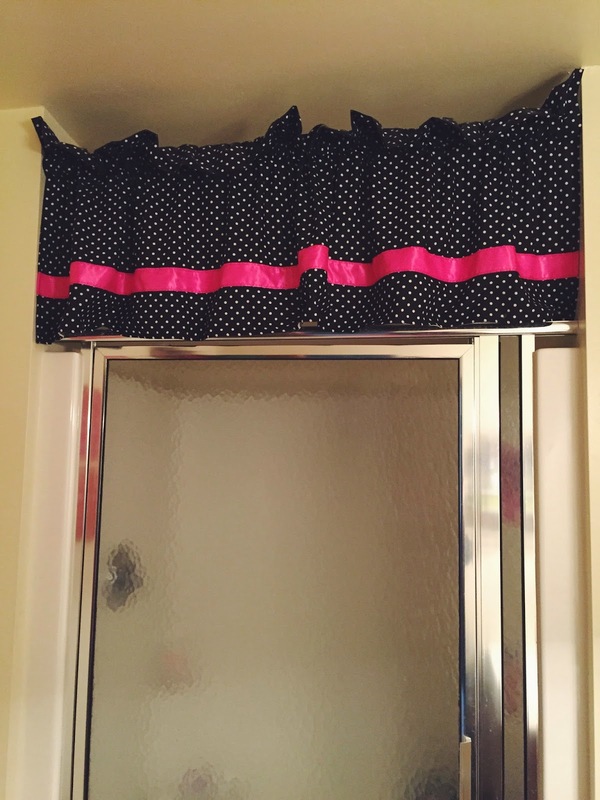 Then there's another awesome addition to the room, the curtain. My aunt sewed it. It's just on one of those expandable rods. Livens up the place, don't you think? 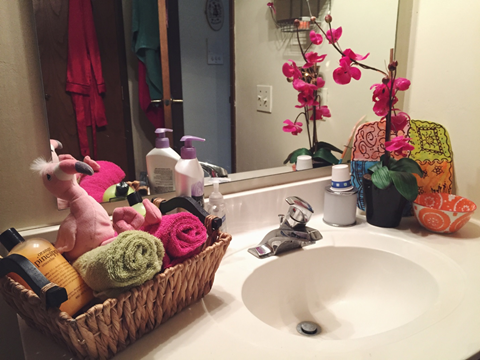 And the sink is what prompted one of my guy friends to say, "Your bathroom is like being in a hotel." Orange bowl via Anthropologie. 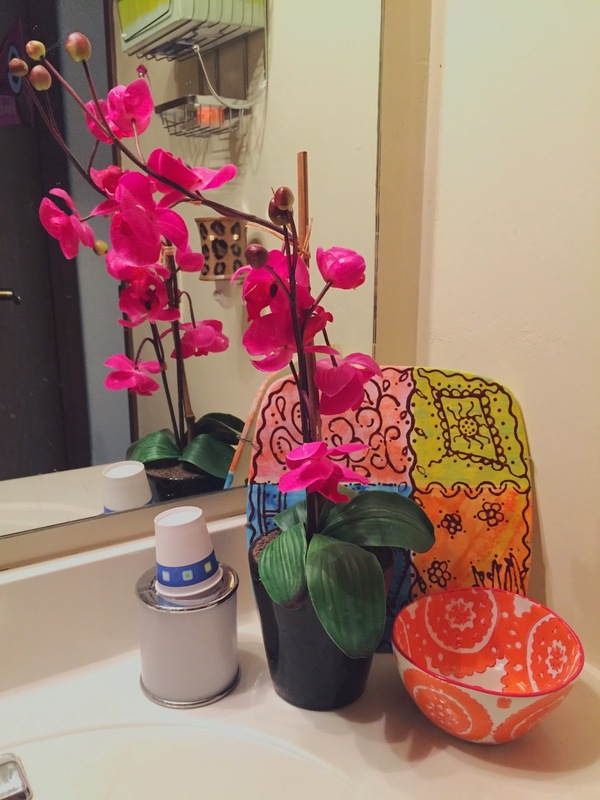 Fake orchid via TJMaxx. Yes, I go through a lot of Philosophy body wash.
My cousin walked out of my bathroom last weekend and was like, "It's weird to see a something from my childhood bedroom in your bathroom..." and I remembered I grabbed that Moroccan looking piece of art (that my aunt also made) from their rummage sale this summer to adopt. Couldn't let it go to waste! 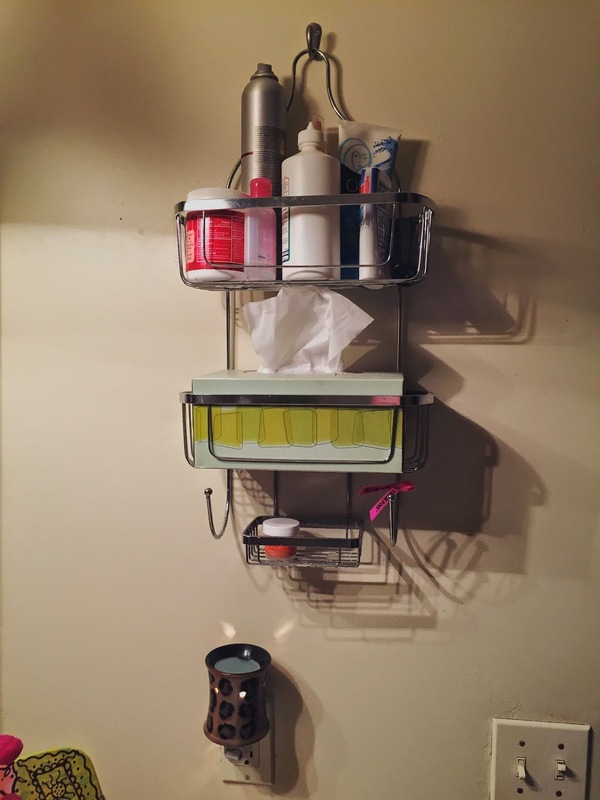 This shower caddy was originally intended to be, yes, a shower caddy. Unfortunately my shower's walls didn't really support that idea. 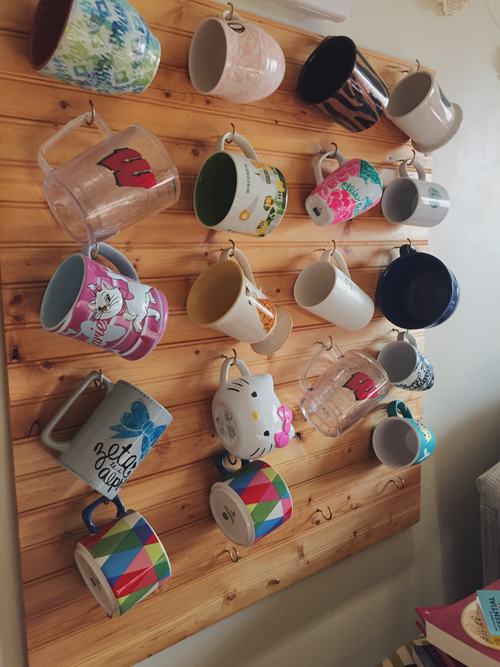 So it's now a wall organizer. 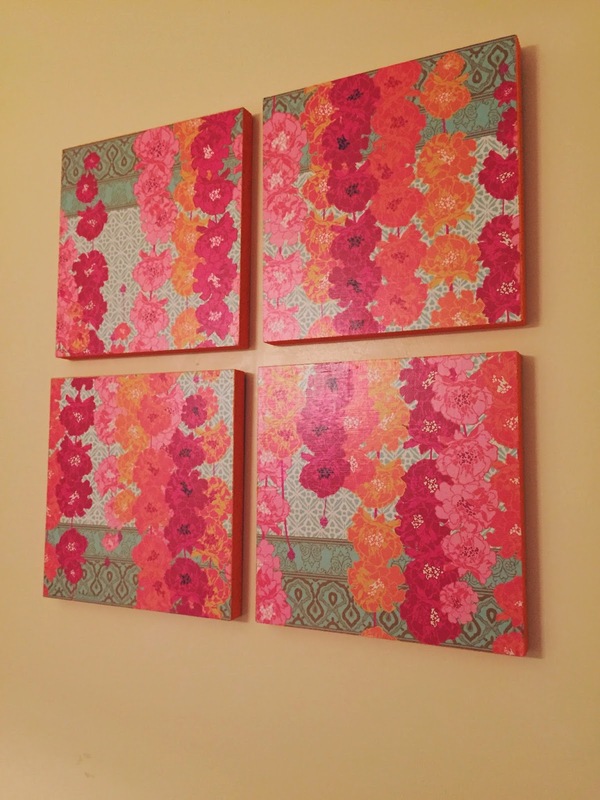 This 4-piece wall hanging is just scrapbook paper from Papersource (one of my all-time favorite stores). We bought wood, had my grandpa cut it, and Mod-Podged the paper to the front. Then I painted the edges. Apparently decorating my apartment was a family affair. 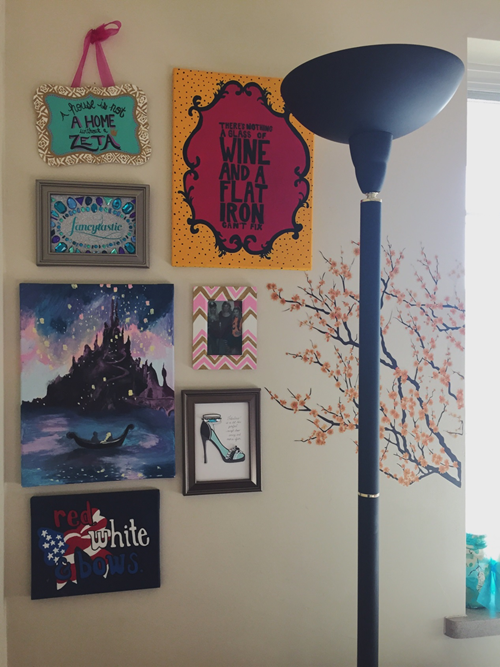 Love these so much that they're going in my bedroom at home when I move out of my apartment in May. It's now really sad to look at my bathroom because I took everything down to pack up immediately after these pictures were taken. :( It's so plain. I hate it plain. As we come to the end of the end of the semester, I've kind of been getting sad about leaving the apartment I've lived in for 2 years. It's just so cute. Graduating, traveling, and moving back to Milwaukee is exciting, but I'll have to live at home :'( I'm kidding it's not that bad. 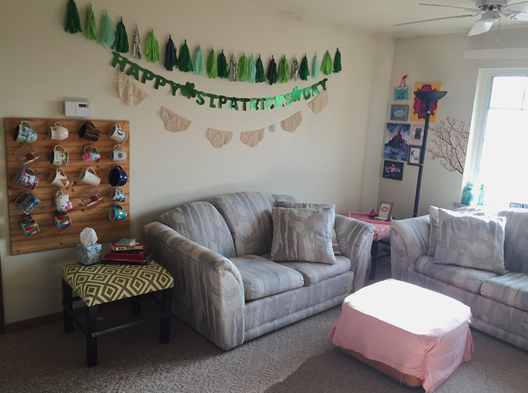 I decided to create weekly postings of the different rooms in my apartment so that I can share all the DIYs I've done while there's still time! And to be able to look back and remember my first apartment, of course. 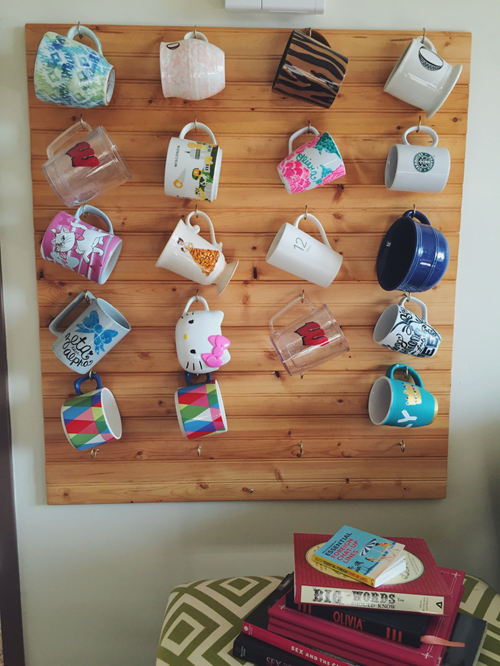 If there's a featured DIY project in the room, I'll focus on it. Maybe I'll even make eventual tutorials! 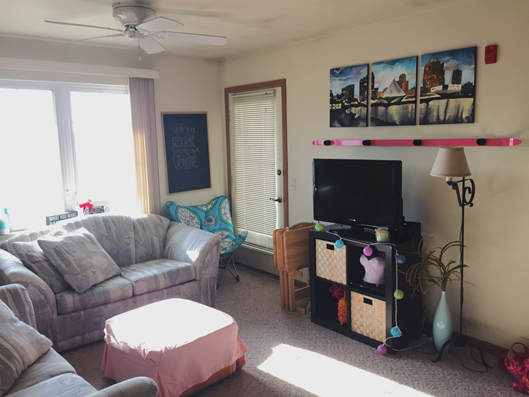 This week's room is.....THE LIVING ROOM! This room is essentially a conglomeration of DIY projects. 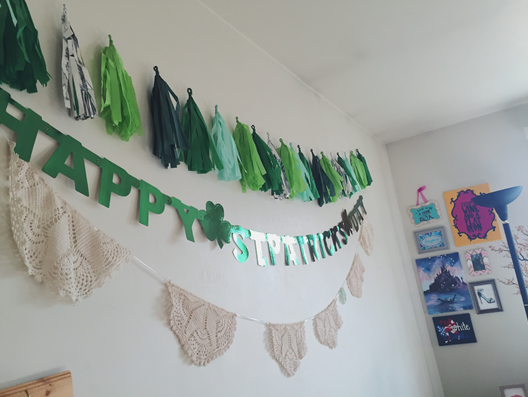 The decorations are basically a product of my imagination ;) because my roommate lets me do whatever I want. It's awesome. Sorry for the outdated holiday decor. I took the pictures last month, oops. My flavor-of-the-month tassel garlands are usually based on what holiday is currently distracting me from all the other things I'm supposed to be doing. I'm a festive person, what can I say? My mom basically cried when I cut those doilies in half to make a garland. At least I get a lot of use out of it. This little cubbie is where most of the paintings hide. I originally had wanted to fill the wall space to the left with paintings/pictures as well, but never got around to it. All paintings done by moi. 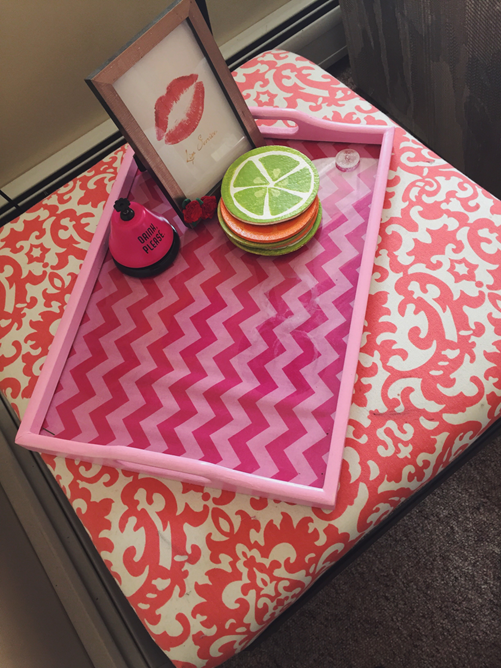 On the table we have a tray that I found at Goodwill, and LET ME TELL YOU, it was hideous. I don't even remember it's original color, but it had goo all over the glass part that you were supposed to stick photos under. I got that off and repainted it. 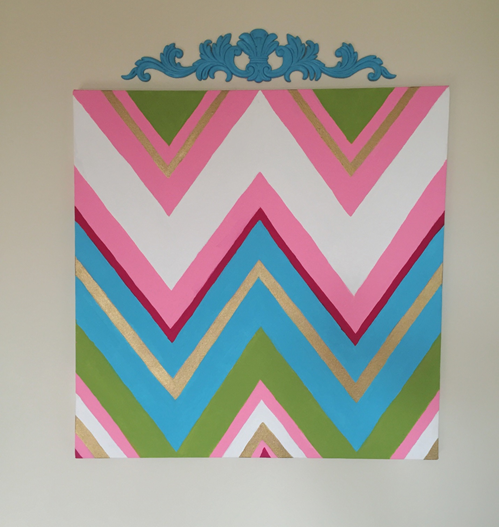 Then I put the chevron fabric underneath. Well now there's two circles of candle wax on there, but it did look good. The coasters were a Pinterest project gone...unexpectedly (as in, the two painted like lemons cracked in half). The framed "Lip Service" print was from Best Friends for Frosting (get your own here for free) that I printed last Valentine's Day. It just stayed. 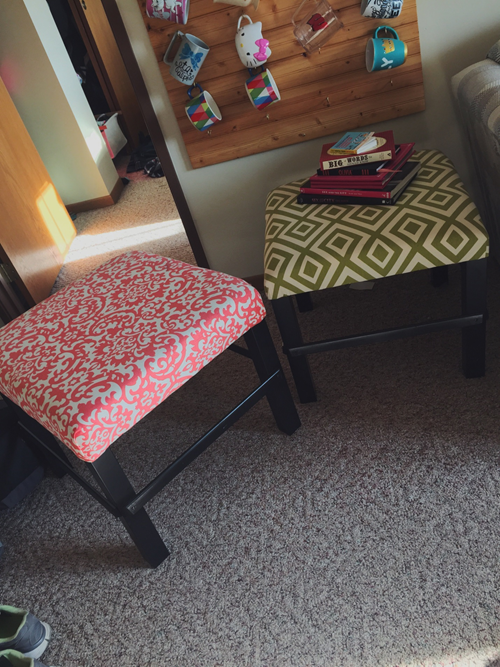 These are the 2 end tables turned foot stools/ottomans turned back into end tables that my mom and I made out of those cheap $8 IKEA tables (with this tutorial). Warning: You will need a staple gun and a bit of muscle. My original intent was for these to be end tables or ottomans, but my parents were SO convinced that someone was going to sit on them and break them (they were kind of unsteady), so my dad put those bars on all four sides. I think someone sat on them once... But I love them. Aaaaaand...to the other side of the room. 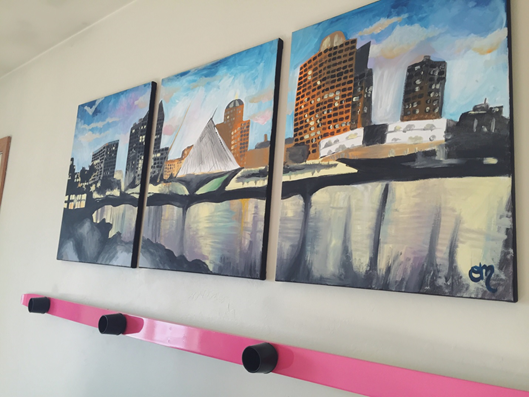 Not too much to see over here, except for my chalkboard, Milwaukee skyline painting, and shotski, respectively. Which brings us to what I like to call "the conversation starter" (or what I call it in my head). Yes, I painted it. Yes, it took me a long time. No, I don't really want to do another one for you (just kidding, I totally would with the right circumstances). And for the shotski you see mounted on the wall, my grandpa made it for me! Overall, I'd say it's a pretty bright and cheery room. Not as bright and cheery as the bathroom (I know, what? ), but a close second.